LATEST: First picture of derailed train and reports from STV reporter at scene. Eight passengers were in hospital after a train travelling from Glasgow to Oban derailed, leaving a carriage "precariously balanced" over a 50ft embankment. The derailment happened near the Falls of Cruachan power station just before 9pm on Sunday. Strathclyde Fire and Rescue service received a 999 call from a passenger who was on the 6.20pm service from Glasgow Queen Street to Oban. 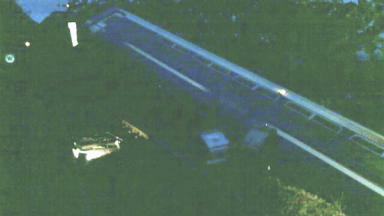 The front carriage of the two-car train caught fire after the derailment. It was left overhanging the road below. All of the 60 passengers on board were rescued from the train. They were said to be shocked and had to be led along the tracks to safety of the nearby station at Falls of Cruachan near Loch Awe in Argyll. STV News reporter Gordon Chree, who was at the scene, said one person was taken to the Southern General hospital in Glasgow with a back injury, three to the Lorn and Islands hospital in Oban and four to the Mid Argyll hospital in Lochgilphead. All the other passengers were allowed to return home. He said a cordon had been set up around the scene as engineers were worried about the safety of the train. The fire service confirmed a major deployment, with engines being sent from Glasgow, Oban, Dalmally, Inveraray and Arrochar to deal with the blaze. Strathclyde fire service sent its major incident unit from Clydebank along with heavy rescue equipment from Easterhouse. Roads in the area - the A85, A819 and B845 between Taynuilt and Dalmally - were closed in both directions to allow emergency services to get to the scene. A spokesman for ScotRail said: "All passengers are safely off the train. An investigation is already under way into the cause of the incident by appropriate agencies and industry partners."